Cooker is a responsive restaurant HTML5 template created by DesignMania, and featured at ThemeForest. It has a nice layout and everything is well organized for easy customization which makes Cooker a great responsive HTML5 restaurant theme. 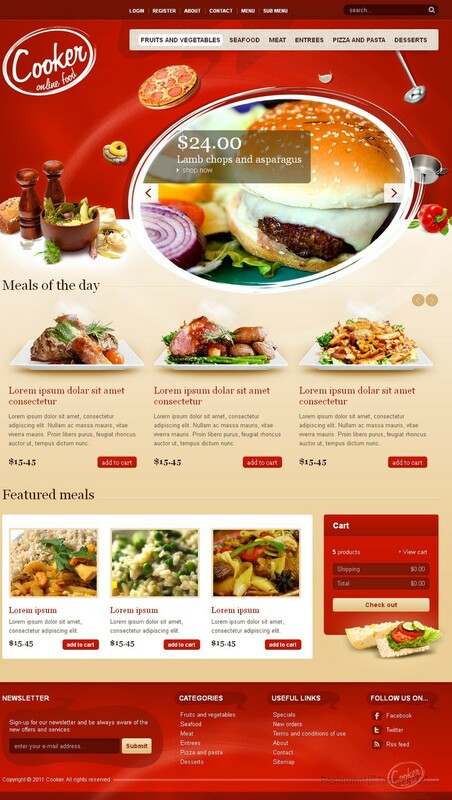 Cooker consists of 7 HTML pages and 2 pop ups, and you will also get 7 PSDs for each of these pages. The homepage features an interesting slider ready for quality photos of your delicious food to overtake your visitor’s attention. Right under it you can have your photos of meals of the day sliding with descriptions under the photos, and make your visitors hungry for you perfectly organized, delicious dishes. You can also feature your favorite dishes with thumbnail photos and teaser text and by clicking on them, your guests will be taken to a full content page, or they can simply click “add to cart” and order online. 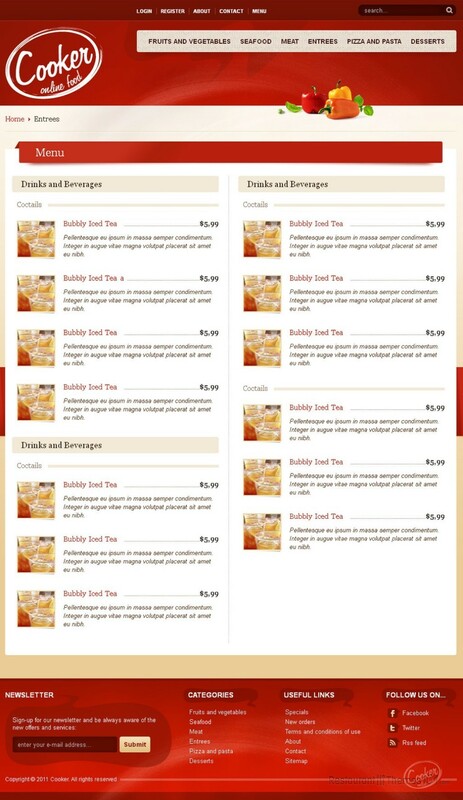 There is a menu and a sub menu available. Both of them looking awesome and well organized with nice categories. The “about” section is reserved for you to properly introduce your restaurant to your guests. Write anything you want here, the history of your place, have your staff introduce themselves or put in some praising comments you got from your happy customers for everyone to see. Your visitors will be able to sign up for your newsletter and always be updated about new offers and services available at your place. The contact page contains a simple contact form for your guests to leave you messages anytime they want. Google Maps integration makes it very easy for anyone to get to your place with exact directions given right there on your website. When it comes to social integration, this theme offers this option as well, so you will be able to connect your website to Facebook and Twitter. Cooker is a well-organized, beautiful looking template that is very customizable and easy to setup and run. 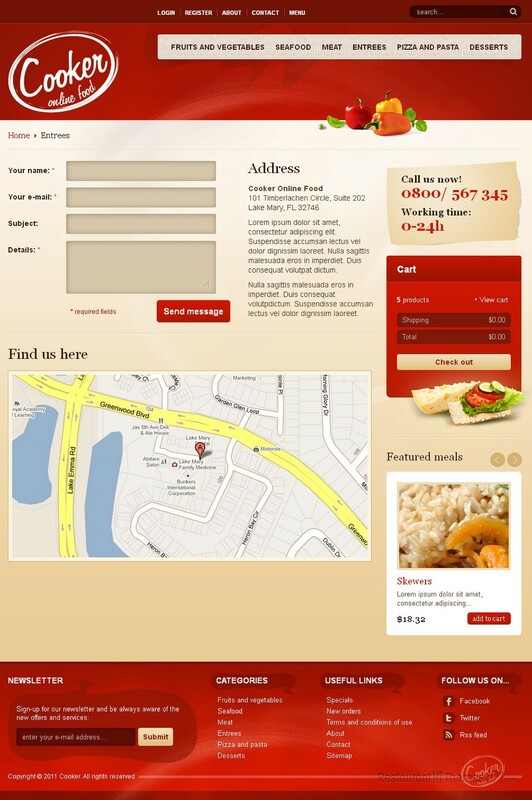 Besides this HTML template you can buy Cooker also as a WordPress or Drupal restaurant theme.